Fast growing timber bamboo with 10% of the grove has bends located in the lower portion of the culm (cane). The wood quality of all bambusoides species is excellent because of the thick walls of the canes. Order within 20 hours 32 mins and your order will ship Tomorrow! 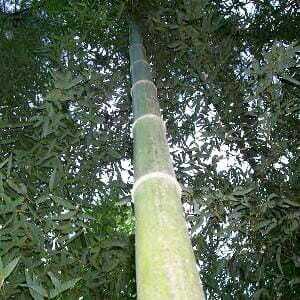 Phyllostachys Bambusoides ‘Slender Crookstem’ is a fast growing giant timber bamboo. 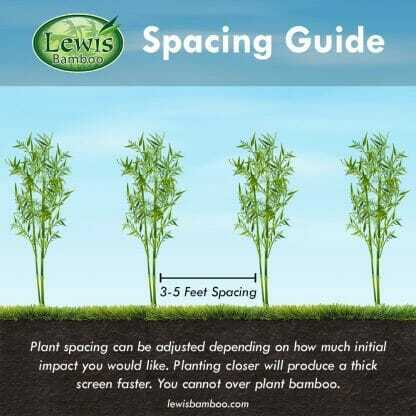 It is very straight and the thick walled canes make it one of the toughest of all the bamboos. Around 10% of the grove will have a very slight bend located in the lower portion of the culm (cane). The wood quality of all bambusoides species is excellent. This species is from Guangdong, China and has been here since 1924. The new shoots are edible and in fact very tasty. Rare in cultivation this beauty looks tough. Very strong appearing with lush dark green foliage. Climate Zone 7 and 8 expect mature size canes to be 50 feet in height. Climate Zone 6 expect mature size canes to be 12 to 18 feet in height. ‘Slender Crookstem’ bamboo is highly prized for use in construction and crafts. Culm (canes) sheaths are a pretty green/reddish coloration. The sheath auricles and oral setae are very distinct. It has the strongest branches of any Phyllostachys. As with most other species, the maximum size will not be obtained in colder climate zones. This bamboo is easy to control with just root pruning and has wide culm spacing in loamy soil. Crookstem is rare in most areas of the country. It also has the low limb characteristics on canes under 2 inch in diameter. So as your grove establishes for the first 3 to 5 years you will have thick foliage close to the ground. 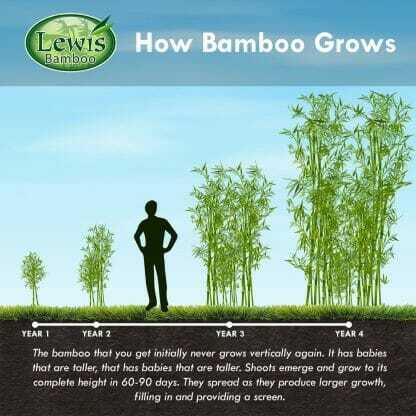 My bamboo came quickly and is healthy looking, my cats are already trying to eat it >_@. I'm excited to see how it does here in kansas. I would order from here again. Good people to do business with, very satisfied. I came home last evening to a wonderful surprise! UPS had delivered four boxes that I assumed wouldn’t arrive until today! The bamboo is beautiful and appears to have traveled quite well. I put each bagged plant in the bathtub and gave them all a good drink. There is a great window of glass block there over the tub so they will have good light and moisture until I can get home this evening. I am so excited! Thanks so very much for your help! I’ll keep y’all posted with my progress.